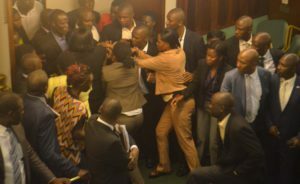 KAMPALA–Parliament was yesterday a scene of raging battles as legislators threw punches, hurled chairs and shoved and banged on benches. This followed the suspension from Parliament of at least 25 legislators accused of turning Parliament into a battleground on Tuesday. Among those suspended include Odongo Otto, Allan Ssewanyana, Ronald Kyagulanyi, Monica Amoding, Sam Lyomoki, Moses Kasibante, Betty Nambooze, Ibrahim Kasozi and Nandala Mafabi. Others are Mubarak Munyagwa, Medard Ssegona, Barnabas Tinkasiimire and Muwanga Kivumbi, among others. 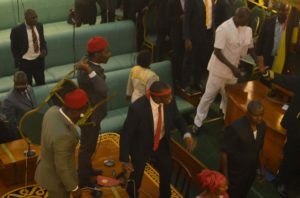 Government and opposition lawmakers came to blows after Speaker Rebecca Kadaga allowed Igara West MP Raphael Magyezi to introduce a motion to kick-start a process to amend Article 102 (b) of the Constitution to remove age limits for persons seeking the highest office in the country. The ensuing violence and endless singing of the nationl anthem by opposition legislators forced the Speaker to adjourn Parliament to the following day (yesterday). 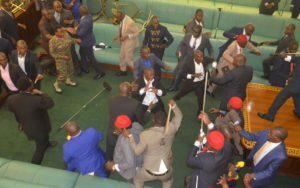 When Parliament resumed yesterday, Chaotic scenes continued with opposition members battling their NRM counterparts and Special Forces Command operatives who were reportedly brought in to deal with the violent legislators. PML Daily brings you the action in pictures. An Oppostion Member of Parliament being dragged out of the chambers by Special Forces Command operatives. Photo by Beatrice Leni. 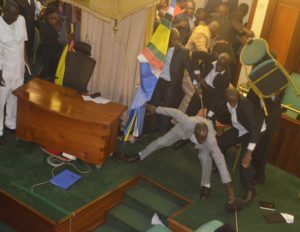 MPs exchange blows on the floor of Parliament yesterday. Photo by Beatrice Leni. Gen Katumba Wamala tries to calm irate opposition MPs. 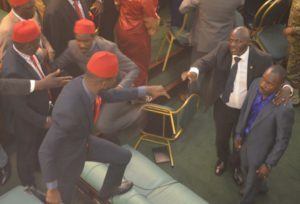 MPs Gerald Karuhanga, Allan Ssewanyana and Fungaroo Kaps standing on the Table of the House as chaos intensified. Kyadondo East MP Robert Kyagulanyi exchanging with Gen Katumba Wamala. Special Forces Command officers picking microphone stands thrown at them by MPs during the heat of the violence. 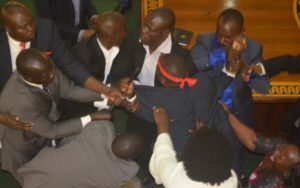 MPs fighting with SFC officers in the chambers of Parliament. 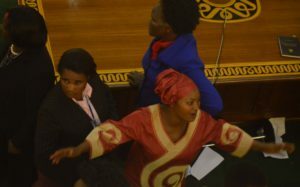 Leader of Opposition Winnie Kiiza pleading with the officers.